My name is Andrew David. I’m an ordinary guy from the Midlands… though I spend most of my time in an Irish fishing village with my wife and two tearaway toddlers. I like to go biking with friends by the River Shannon and enjoy a curry on Saturday nights. Sounds like an innocent life, right? Truth is, where I live is something of a secret hideaway. Unbeknown to many of my neighbours, I make my living by being a thorn in the side of greedy British Bookmakers. …and I do it by turning the bookies’ sneaky pricing tricks against them… plundering their own websites to find low risk bets… and trading bets off against each other on betting exchanges where I call the shots, not the bookmaker! At the same time, I’ve made a name for myself helping others turn the same low-risk betting strategies into a long term income. For instance, Little Acorns, which won five Betting Oscars for “best horse racing system” in 2013, 2014, 2015, 2016 and 2017. Or there’s the highly praised Football Bankbuilder and PEM (Price Equalisation Method). Or there’s the Legacy & Saver, which I run myself and gets regular reviews like this. If you want to see how the professionals earn money from betting, I’d like to take you under my wing and give you online training in all of my strategies so that you can gradually build a profitable betting portfolio just like mine. You could be up and running with your first system within a day. The reason I call it a portfolio is because it’s far closer to a stock market investment strategy than it is to gambling. In my experience, a single betting system is a risky thing to follow. Hardly any of the big players slavishly stick to one method for life, so why should you? If you’ve tried a system or followed a tipster before, you might have found that it worked OK for a short while…. then… kind of…. trailed… into… losses. Next thing you know, you’re on the hunt for something new. However, when you combine multiple betting systems… tweaking and adjusting them… dropping bad ones when they stop working and replacing them with new ones… well that’s when amazing things can happen to your bank balance. With this approach you’ll off-set any losses from poorly performing strategies with the ones that work, and SLOWLY build your wealth over time. Let me build you a professional betting portfolio… and help you run it profitably, month after month. I’m looking for keen amateur betting punters to join my inner circle, on a trial basis, so you can use my strategies on a week-by-week basis, with online coaching and support, including video tuition. If you’re successful in getting a place today, I’ll not only give you a masterclass in my low-risk betting approach, but I’ll BUILD you a professional-level portfolio in as little as 30 days. This will be fitted around YOUR levels of free time, YOUR levels of interest and YOUR appetite for risk. It could be that you can only bet on weekdays, or evenings, or only weekends… you can pick whatever’s best for you and your daily commitments. Work, family, hobbies – you can fit this around all of them. The aim is to make you just £10-£15 per day from each one of these betting strategies. Think about that… a £10 a day profit. Hardly ambitious or “get rich quick” is it? And yet £10 per day from just THREE methods could earn you £900 or more every month, TAX-FREE. Think about what you could do with that kind of money on top of what you already make! It would take you about an hour per day to run three of these strategies and earn this kind of income. But you can choose to add as many as you like, dropping those that don’t perform as well, and adding others as you go along. But I’d like to prove this will work without you shouldering the risk. Come on-board today and I will coach you in my strategies through online training webinars and email support. Try it for the next month and see proof of how 30-60 minutes “work” following my instructions every day could add as much as £900 or more to your monthly income. If you’re not 100% sure, then you can walk away from it. Not a problem! I’ve built up a reputation for delivering profitable systems, so I’m not in the habit of hoodwinking people. I don’t expect you to commit to something that doesn’t work. So if this doesn’t make you the money you expect in 30 days, walk away and pay me nothing. You don’t even have to bet with real money if you’re unsure. Test my claims on paper and the whole experience will be risk-free. So are you up for something that’s fun and profitable, for a little “work” in your spare time? Then read on and I’ll explain everything you need to know about how we’re going to annoy the hell out of bookies and other betting exchange users. First, let me make something clear. This is not about predicting the future, using a crystal ball, getting “Inside information” or any of those bogus tea-leaf-reading strategies that get peddled. This is all about using the bookies OWN tricks and pricing to find low risk, high value bets. It’s about using that information to trade bets on exchanges where you have the competitive advantage. How FREE information provided by Skybet Bookmakers can bag you £100 to £200 profit from Betfair… every month! How to snag an average profit of £3.00 a race using FREE information taken from the ‘At the Races’ website. How to profit from draws and beat the mafia at their own game through Italian Football – and also other leagues worldwide when the opportunity arises (don’t worry, I’ll show you everything you need to know). How to get BIG odds on your side using a psychological ploy which is almost always overlooked. How to make easy profits from long-term novelty markets such as Big Brother, I’m a Celebrity, and politics. How place doubles have given me solid gains in just 15 minutes a day. You must do the exact opposite to what the bookies want… and behave in the exact opposite way to how most punters behave. Because let’s not beat about the bush. Bookmakers are there to take your money. They’re NOT there to provide people with a living. They invest a lot of money and expertise in finding ways to attract new punters and take the lion’s share of their cash. Avoid this stuff like the plague. Your bookie doesn’t offer these prices out of the goodness of their hearts (did I say bookmakers have hearts?) they are simply ‘drawing’ you in like a magnet… then a little further down the line, they take you for every penny. Fact is, they’re out for your cash. And they do it well. This is why they make millions in profit every year. Just ask yourself, when was the last time you met a millionaire punter? Sure, you might have seen a glossy brochure or slick webpage from some suited geezer standing by a Porsche who CLAIMS they make millions… but it’s almost ALWAYS total nonsense. The internet is full of sharks like these. You may follow them at your peril. Over the years I’ve mixed and indeed worked with some of the biggest pro-gamblers in the UK & Ireland. Some are well known, others not so well known. Most of them play with huge amounts of money and like to keep under the radar for obvious reasons. They’re not shouting out from badly designed websites while fanning wads of cash. However, that doesn’t mean only the big bucks players can make money from the betting market. There’s a whole load of people who do it quietly, discreetly, earning much more modest sums of money. If you’re prepared to be realistic in your expectations, it’s perfectly possible to take money from the bookies on a regular basis, with a starting bank of as little as £500. I know, because this is what I do for a living. I may not be a multi-millionaire, but I get to spend time with my family and friends in a beautiful Irish village, without commuting or being told what to do by my boss. If you join me in my brand new masterclass, I will create for you a betting portfolio made of at least 3 low-risk strategies which will work together to earn you a regular income. Using video tutorials and email support I’ll make sure these stay profitable throughout the year. Finally, you could start earning an income from betting that could make a real difference to your life. I’m talking about earning £900+ every month, simply from spending up to 60 minutes per day placing low risk bets with my help. If you’re interested, I’ll give you instant access right now, risk-free for 30 days. Or if you’re still a bit uncertain that I can do everything I promise, that’s totally understandable. I’ve loved betting since the age of 14, when I used to get my older-looking mate Sean to place bets for me. In my 20s I even worked as a bookmaker’s apprentice where I learned a lot of skills. But I hated being part of the establishment, parting punters from their money with unfair odds and tricks that tapped into their emotions and bias. So I began to develop my own betting systems with varying degrees of success and plenty of losing streaks! It was only in 1999, when online betting exchanges came along, that I realised there was an opportunity to escape the greedy clutches of the bookmaker and start betting on my own terms. You see, betting exchanges like Betway, Smarkets, BetDaq, and Matchbook allow you to bet against other gamblers and not the house. This gives you a genuinely profitable edge. By 1997 I was betting full time, using exchanges as the foundations of methods like Little Acorns that won praise and recognition from industry professionals. Now for the first time ever I’m going to give a limited number of people a masterclass in how to apply exactly the same proven systems, strategies and tools I use to make money right now. By the end of a month I promise you’ll have the beginnings of your own £900-per-month betting portfolio fitted to your levels of commitment, free time, wealth and appetite for risk. To make sure this happens I’ll guide you, coach you, support you… give you everything you need to make this work without finger-biting stress and reckless levels of risk. You see truly successful betting isn’t ONLY about playing the betting exchanges. It’s about your methodology and timing. This is why I’d urge you to come and join me today on my service Quick-fire Betting Profits, where you can get a masterclass in my methods, plus a portfolio of strategies suited to your goals, and my ongoing support so you can make these strategies work in the real world! 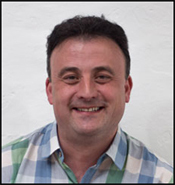 If you manage to secure a place, I’ll share the hard-won secrets of success, including details of some of my biggest wins which saw panic-stricken bookies scrambling to severely restrict my accounts. I have advised a 50/1 winner and many other big priced winners for members of my each-way service. I’ve enjoyed 4 out of 5 winning Cheltenham Festivals through the tips I gave to readers of What Really Wins Money, a newsletter service, published by Canonbury Publishing. I personally won £17,500 on Hawkeyethenoo Stewards cup at Goodwood. So look, it’s no big secret that I can make money from betting. But now I want to bring you into my circle and show you all my latest methods. 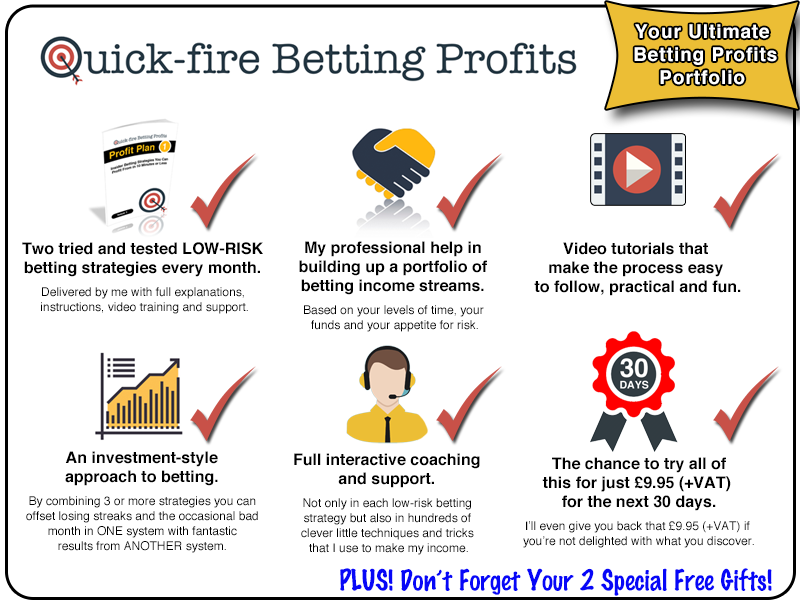 As you learn my secrets, I’ll help you create your own portfolio of systems in my new service Quick-fire Betting Profits – and make sure you run them without any problems and frustrations. Join me today and I’ll offer you at least 36 low-risk betting strategies over the next 18 months. Each month you’ll get at least TWO proven new betting strategies that I personally use. Each strategy is designed to make between £5 – £15 daily from small stakes ranging from £2 – £10. With my guidance you can hand-pick the ones that suit you most in terms of time available, appetite for risk and your available funds. Then you can operate them in a portfolio approach, dropping some and adding others, so that you’re constantly profitable. In my experience you’ll need to operate at least 3 at any one time. This will take no more than an hour every day. But if you have more time you can add more. How a Eureka moment at the annual Punchestown festival helped create a devastatingly simply strategy you can use to profit across all sports. Why following ‘steamers’ could damage your wealth. How to detect price erosion and use it to save a bundle. Why you must think carefully before placing Horse Racing bets on Saturdays and Bank Holidays. Read this first! How to profit from bonuses in ways no one else will tell you – more than likely because they don’t know. …plus a great deal more. WARNING! Some of these methods do go against the grain and break a lot of the rules you’ll find in most betting manuals… but they really work, and that’s what I’m all about – finding proven, profitable methods that step outside normal conventional thinking. If any of these apply to you, then this course is for you too. I’ll show you a whole raft of angles, on how to make your betting pay… how to spot real value… and how to control your risk so that your bank piles up, month after month. So if you’re interested in joining me, please click the link below and reserve a place. You’ll get sent the first TWO high-performing quality betting systems to get you started from day one. Nothing is left to chance and within days of engaging in the first module of the course materials you can be up and running with your new found betting skills. As you’d expect, if I’m coaching people, supporting them via email and sharing all my trade secrets, then I can’t take unlimited numbers of people. So if you’re interested, I’d urge you to snap this up today and guarantee yourself a place. Remember, there’s no commitment at all – you can opt out in the first 30 days and get a full refund. You can even test me out on paper so you remove all the risk entirely. This means you genuinely have nothing to lose! Bearing in mind that just ONE basic betting strategy can often cost upward of £37-£67 in a single manual…. and you’re getting TWO every month from me…. I hope you’ll be pleasantly surprised by the price. You can enrol on Quick-fire Betting Profits for the next 30 days for just £9.95 (+VAT). If you like what you see, then I’m sure you’ll be more than happy to pay the regular monthly price of £24.95 (+VAT). Even this £9.95 (+VAT) is RISK-FREE. If for any reason you change your mind during the 30 day trial you can cancel and that £9.95 (+VAT) will be returned. It’ll take a minute to process your details. After which I’ll send you a personal username and password by email. This gives you instant access to the secure membership site where you’ll find the first module of the course including your first betting strategies. This will be updated every month with two new methods and systems to try out. And as an extra reward, if you respond today, I’m also going to give you instant access to two special bonus reports. These are yours to keep whatever you decide about Quick-fire Betting Profits. But I’m sure you’ll want to stick with it, because make no mistake; this game-changer course has the potential to earn you money from the fascinating and often thrilling sports betting world. So why not take this first step on the road to making your bets pay enough to change your life? Click now on the enrol button below to access the first Quick-fire Betting systems for £9.95 (+VAT), with a 30 day money-back trial to make sure you’re happy. See how it all works, put your new knowledge to profitable use, let the results roll in and see the money in your bank account. If you’re not totally thrilled with the results, then you can walk away. But if I was a betting man – which I am – then I’d be confident that you’ll stick with this. It’s an approach to betting that is giving me a wonderful life and I’m sure it can do the same for you. PS. Don’t forget you can also access your two betting system FREE gifts when you access the first module of the course today, risk-free.